We service all brands of air conditioning and heating equipment. But we primarily recommend industry award-winning Rheem Comfort Systems for your home or business. We are a contractor for heating, air conditioning, water heating and plumbing. 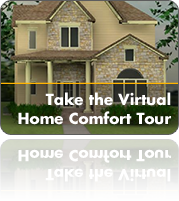 Please take the virtual tour of the entire Rheem product line and see for yourself why Rheem Air Conditioning and Heating Products are the best. You can schedule an appointment by calling us or by filling out the request page above. Thanks again for visiting! Copyright © 2019 Stewart Plumbing, Heating, Cooling & Drains L.L.C - State ID #46343. All Rights Reserved.